May 7, 2018 at 12:08a.m. Photo by Dianna Oatridge | Jackson-Milton ace Sebastian Lay takes aim during the Blue Jays’ 10-1 victory over Leetonia on Saturday. The lefthander recently allowed no runs over 252⁄3 innings. Sebastian Lay didn’t start his athletic career with Jackson-Milton High School, but he’ll leave as one of the Blue Jays’ most beloved athletes. The senior from Tennessee grew up with Mahoning Valley ties — his father and grandfather are Jackson-Milton graduates. But with his father in the military, Lay had two spells in Tennessee sandwiching some time in Washington. He didn’t reach Ohio until his junior season. He’s been the essential piece for Jackson-Milton (10-9) with a campaign that will be recorded in the OHSAA’s record book. From April 5-26, the left-hander threw 252⁄3 scoreless innings, making him the 27th pitcher in state history to throw at least 25 scoreless innings. The record is 712⁄3 innings by Wheelersburg’s Derek Moore in 2012. 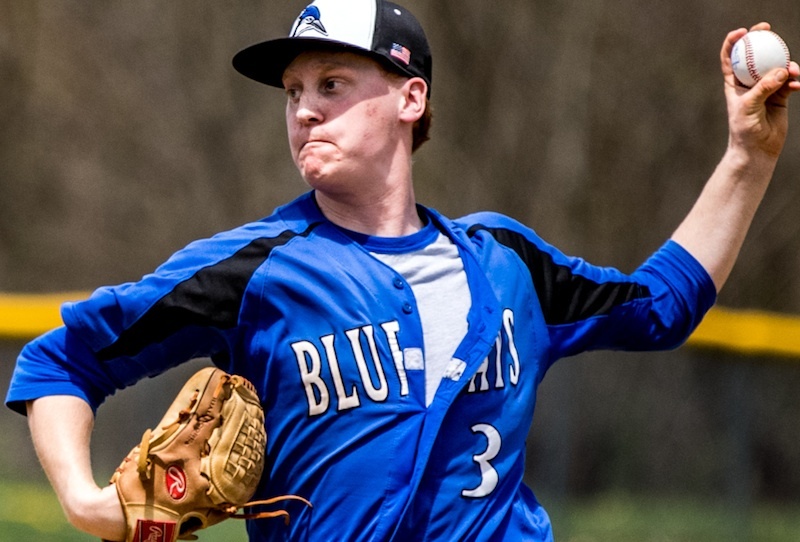 Lay also had 18 straight innings without a walk from April 12-May 1, which ties him with Sardinia Eastern’s Philip Martin for 17th place in the state rankings. For the season, Lay is 7-1 and has given up just four earned runs, 16 hits and eight walks while striking out 114. With the regular season winding down, Lay could still nab another record. He’s chasing the school single-season mark for strikeouts. Assistant coach Matt Ruby holds the record at 125. A quarterback for a two-win football team and a starting point guard for three-win basketball team this year, Lay has learned from a rough fall and winter. “You have to relax and keep calm, you can’t let what’s going on get to you,” Lay said. On Saturday after a 10-1 victory against Leetonia, Lay was honored as the team’s lone senior on Senior Day. He walked under his teammates’ bats and threw a ceremonial pitch to his mother, Jennifer Lay. After the ceremony, he was approached by a young kid requesting an autograph. The lefty who considers himself a Tennessee native was flattered. In addition to helping Little Leaguers in the summer, Lay also has earned the trust of Hogue to lead the team. If Lay has his way, he’ll continue to be somebody people will listen to. He’ll study sports management while playing baseball at Owens Community College.